ACCESS: Paved road to the campground, dirt road within the campground. Any rig should be able to access the campsites. SURFACING: Dirt and gravel parking pads. The overflow area is a sandy dirt. Note: Service on my AT&T iPhone 5s was erratic. Sometimes it indicated No Service. Other times it indicated, GPRS, Edge or 4G data. Tests with my Verizon iPad Air were likewise inconsistent. The above pertains to results both with and without my Wilson Mobile 4G booster. Suffice it to say I had service with the iPad all the time, but with the phone it was on and off. 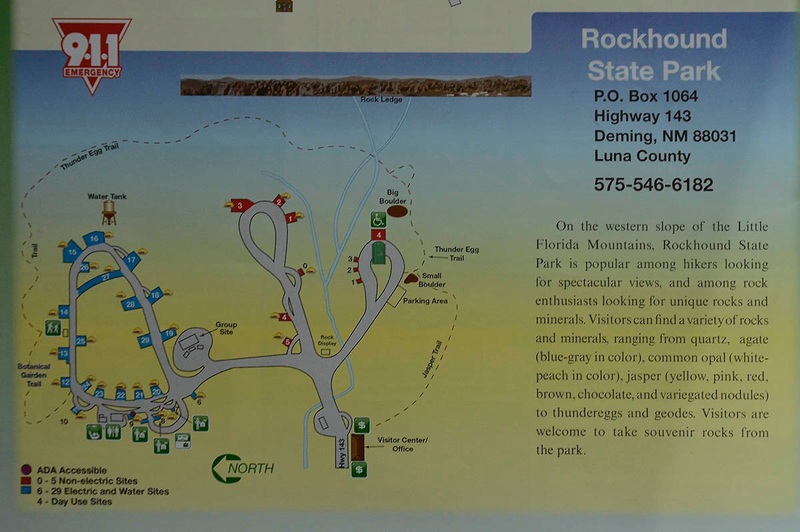 Rockhound State Park Campground Map. Note the legend in the lower left corner. SHOWER RATING: Pass (I evaluate showers in a similar fashion to restrooms. See above.) Despite the self-timer-push-button operation, no ability to adjust the temperature, and shower curtain that was drawn into the shower by the draft and clung to my leg I gave this shower a passing grade because it was clean, spacious, the water temp was pretty good and the shower stayed on long enough that you didn’t have to push the button every 30 seconds. I eliminated the shower curtain problem by cracking it open an inch on one side. Text on this sign at Rockhound State Park say it’s OK to take rocks out of the park. 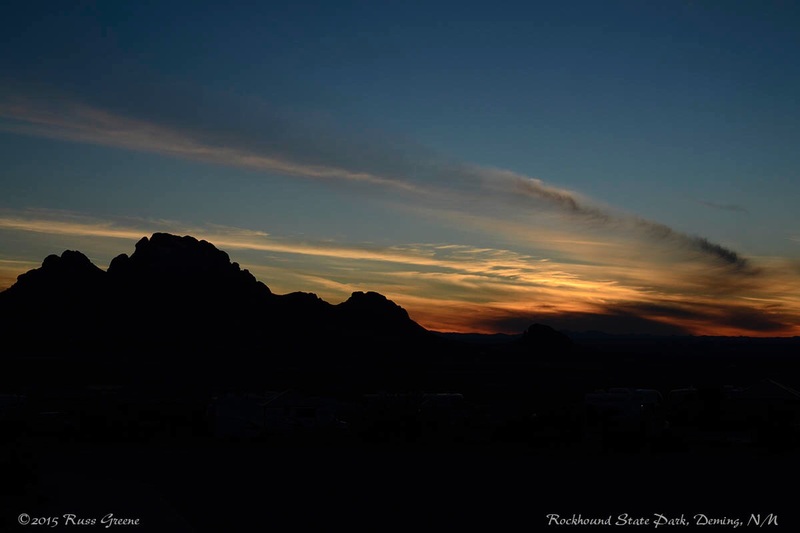 I stopped at Rockhound for a couple days on my way from Oliver Lee State Park near White Sands National Monument to Quartzsite, AZ where I was headed to partake in the RV show spectacle that happens there in Januaries. 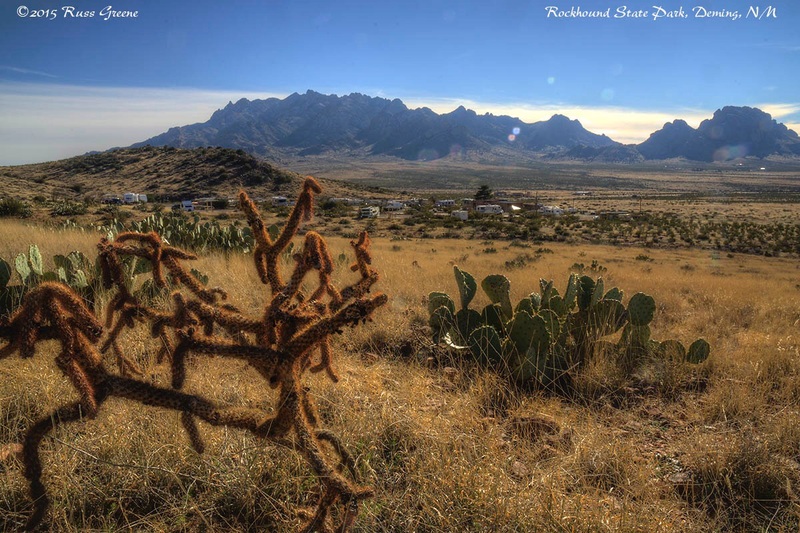 The campground is on a desert hillside with views both of the nearby Florida Mountains and part of the city of Deming. Roads to the campground are paved, but within it they are sandy. I was confused about the campsite numbering system in this park. The electrical podium at my site said GS3 and the host said that’s the spot I was in but I saw no such designation on the campground map. As it turns out the reason for that is that I was put into an overflow site that isn’t on the map. There are several of these, side by side, crammed together like sites are crammed together at some commercial parks. The other sites at Rockhound don’t suffer this, however, and have much more space around them. 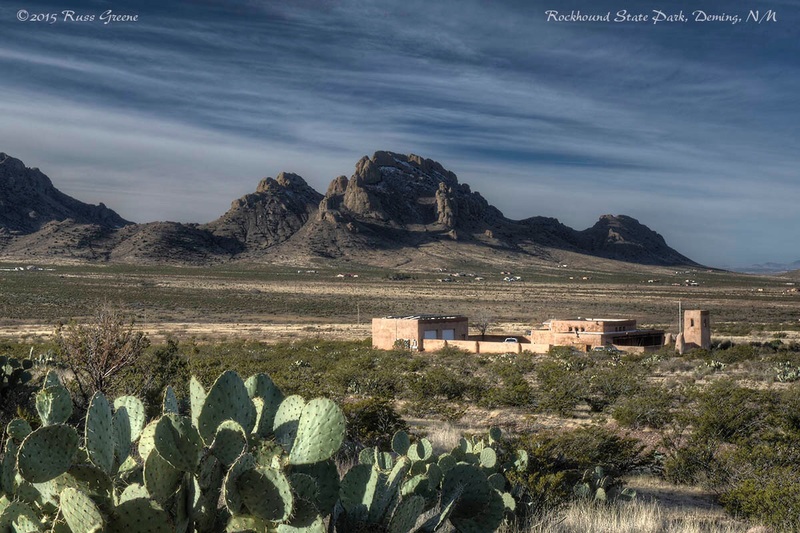 In this shot, taken from near the trial that circles around behind Rockhound campground, you can see part of Deming in the background and get a feel of the character of the terrain. This is a busy little park, at least at this time of year which is their busy season. I think it’s really hot here in the summer and people stay away. There is no shade, and no river or lake to cool off in. Most sites are first-come-first-served (see the campground map included with this article) but a few are reservable. The views of the nearby Florida mountains are nice. It’s a lovely, craggy little range. I hiked two trails that lead out from the campground. One goes a half mile to the little Visitor Center, the other makes a 1.1 mile semicircular loop around the campground up on the hillside behind it. There is a lot of cactus here, primarily prickly pear, but I saw quite a few other varieties. Other desert plants thrive here as well. 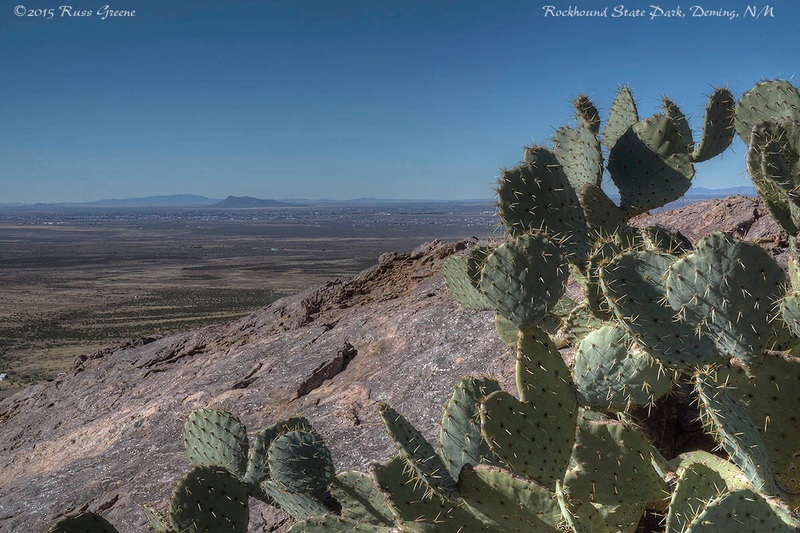 At the Visitor Center, along with photos of coyotes, mountain lions and other animals I saw a shot of a jaguar, but when I inquired if they are found in the area I was told “no” but that they have been seen maybe 25 miles south. This little rest stop is found along the 1.1 mile Thunder Egg Trail which leads out of one end of Rockhound Campground, climbs partway up the hill behind it and circles round before descending to the other side of the campground. The campground is mostly obscured by the structure but you can see some RVs over on the right. In National Parks they will cut off your hands if you try to take anything from them like rocks or pine cones… “Take only photographs, leave only footprints”. Here, they actually encourage campers to take up to 15 pounds of rocks home with them… “Haul this junk out of here for us”. OK, I made that up, and the part about having your hands cut off too, but they do encourage you to collect rocks to take home. 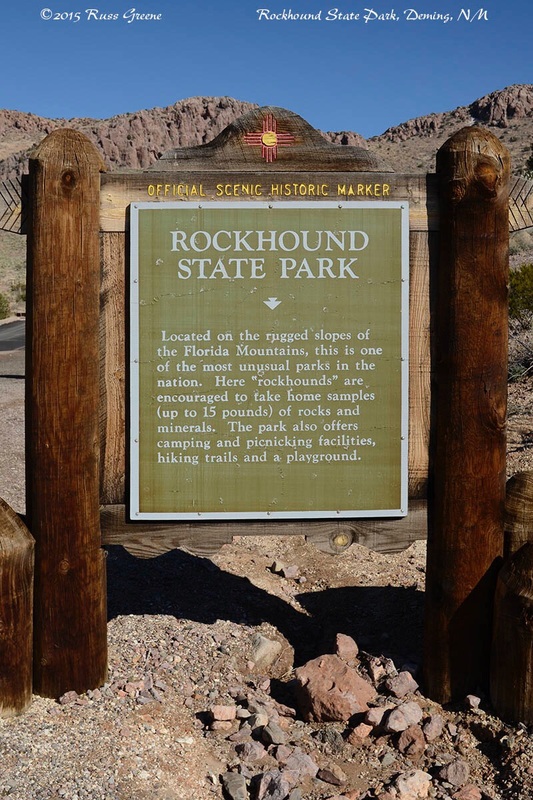 The park takes it’s name from the fact that semiprecious gemstones and geodes can be found in the area. I saw quite a few people “rockhoundiing”. Rockhound Campground is on the small side, but with overflow has over 30 sites. Those are the Florida Mountains in the distance. There is a little botanical garden trail by the campground but there is another at the visitor center which I much preferred because there were more plants with identifying placards. 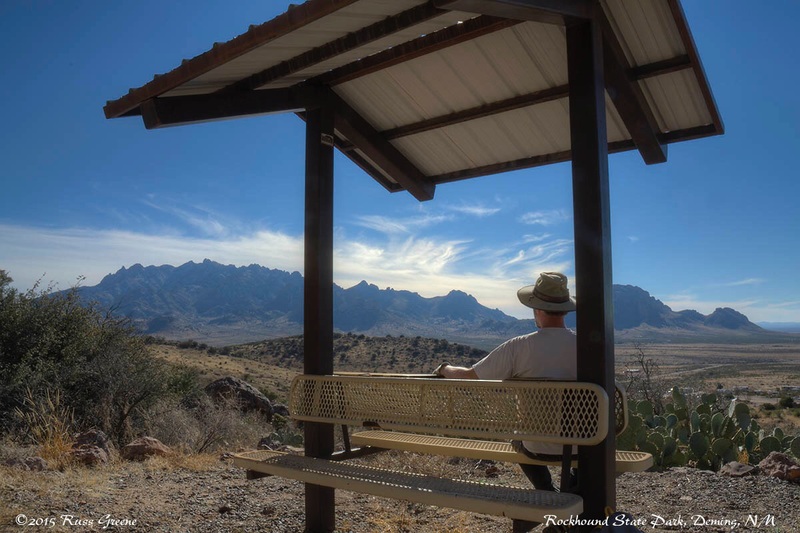 For boondockers I understand there is a little patch of BLM land a little bit nearer the Florida Mountains–a neighbor showed me on his map.